A high quality Ladies Swiss Automatic Watch featuring an elegant White Mother of Pearl dial, set with shimmering purple Rubies and a stylish stainless steel strap - Boasting a fabulous, timeless design. 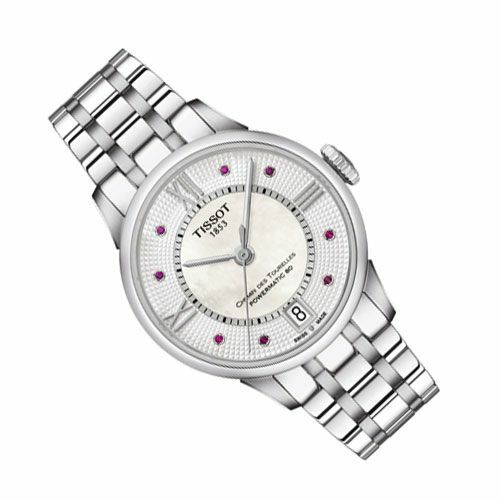 Suitable for any occasion, Tissot Designer Watches are an ideal gift choice. Creating a fabulous look, perfect to be teamed up with matching pieces from the Steffans Jewellery Collection. A stunning Tissot Designer Watch, offering a contemporary style combined with reliable Swiss quality, offering an impressive 80 hours reserve. Suitable for all occasions, this is an ideal gift choice for someone special. The Tissot Chemin des Tourelles offers a contemporary design with an elegant case. Providing precision and luxury, displayed in a superb timepiece - Merging a practical timekeeping tool with a stylish and timeless design. Featuring exquisite detailing, an elegant Mother of Pearl clock face, set with 8 beautfiul purple rubies and a stylish sainless steel trap, completing the picture of classical chic. Forming part of the popular the Tissot T-Classic Watch Range, the Tissot Powermatic 80 Watch boats a modern design, suitable to match any outfit style. Perfect to be combined with designer jewellery pieces from our Gents Jewellery Collection to create a stylish look. Purchase the designer Tissot Automatic Watch from Steffans Jewellers today for FREE Next Day Delivery, with 60 day returns on all orders and an optional gift wrap service.